I wonder how many people have said or thought that in the last 50 or 100 years. Not many, I’d bet, but perhaps I’m wrong. I’d like to be pleasantly surprised and find that it’s more than I think. 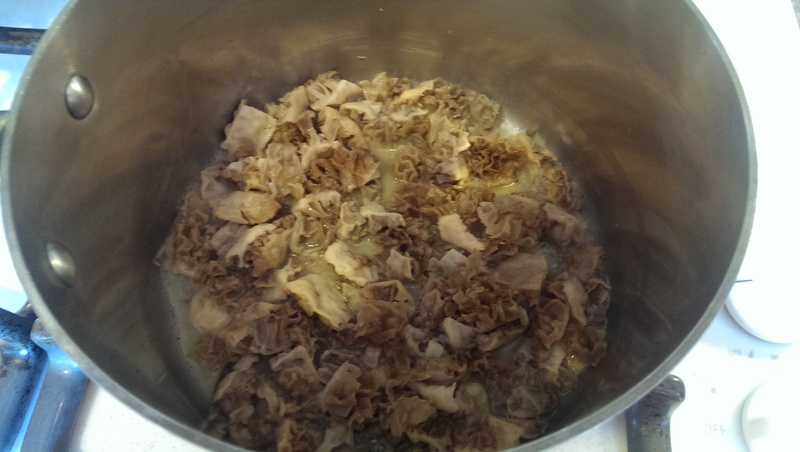 I know there is a semi-secretive but emerging group of wild food specialists out there, but I thought they stayed mostly to mushrooms. Speaking of pleasantly surprised, I was after my recent cattail adventure. Our pond is overrun with cattails, and up to a few days ago I looked on them with disapproval mingled with despair. Our pond wants to be a swamp again, and the cattails are the first determined step it is taking to revert to its natural state. In the past we have used a backhoe to dig them out when they got to be too abundant, and on occasion my husband will don full waders and attack them with hoe and shovel, but it seems to be a futile attempt: they continue to populate at an alarming rate. Well, yesterday I got my revenge. 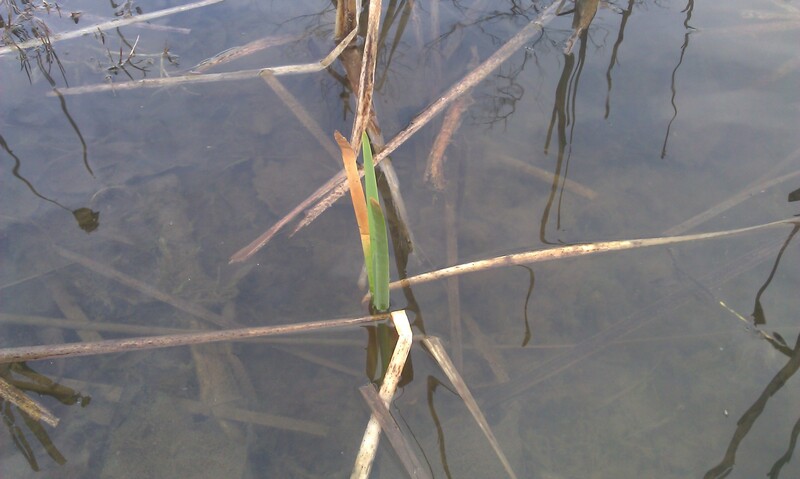 I went out to the pond, sharp knife in hand, and cut all the new shoots just emerging from the shallows. 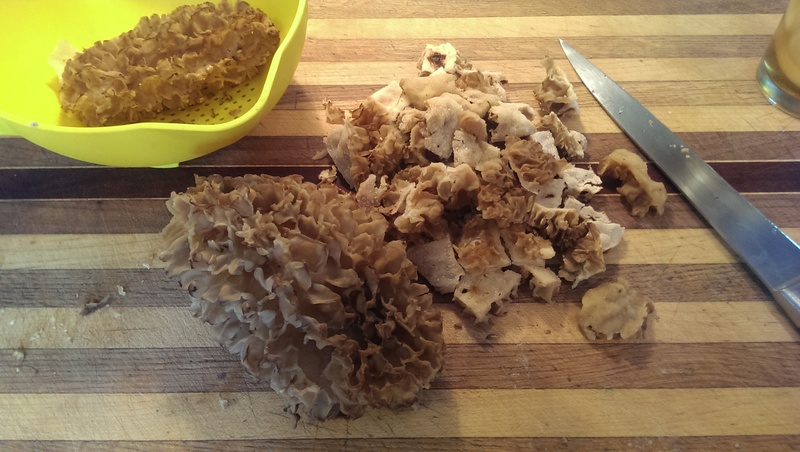 I peeled off the outer green stalk, took them home and ATE THEM! HAHAHAHA! The surprising thing was that they were actually good. Really. Good. Cattails can be great fun, especially for kids. Bashing each other with the cigar-like heads and creating a haze of cattail spores is a treasured summer pastime for those with ponds nearby. The heads can also be used as impromptu torches. They smoke wildly and make a terrific mess, but it’s still fun. Then recently I was killing time reading a book called Foraging New England by Tom Seymour and learned that cattails are edible. I thought I’d give it a try. First I tried them raw. 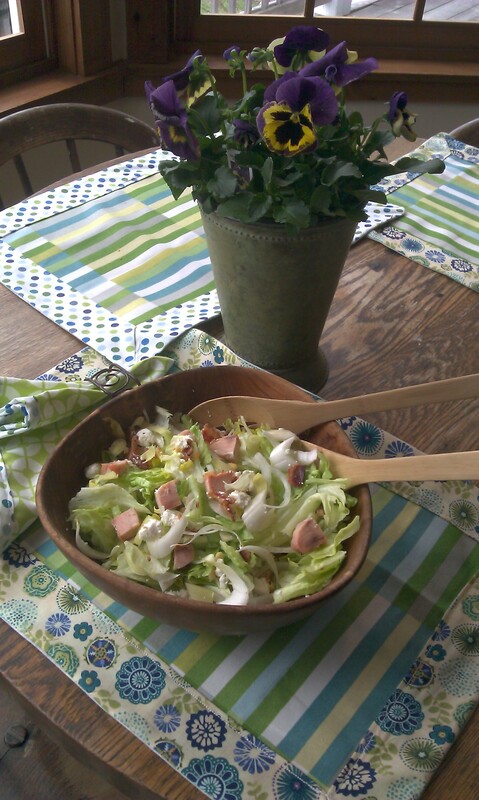 As I had been thinking about endive, I started there, and made a salad with celery, Bibb lettuce, endive, and sliced cattails. For protein I added some chopped grilled salmon and some bacon, and topped it with a crumble of chevre and pine nits. It was entirely delicious. Then I decided to try them cooked. 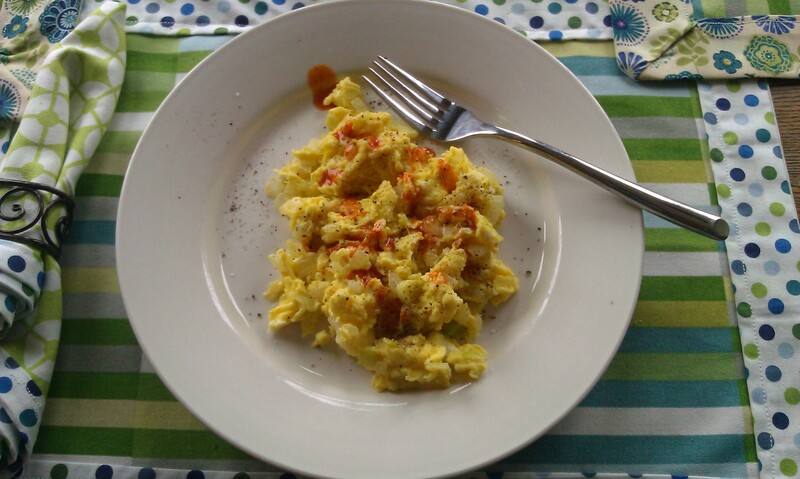 Everything (in my opinion) goes with eggs, so I decided on an onion and cattail scramble, served with salt, pepper, and a dash of hot sauce. (My favorite is homemade, but Cholula is a good store-bought second). That was a success. The cattails held up well, and didn’t get mushy as I feared. Next time I’ll try sautéed fennel and cattails with garlic cream sauce as a side. I even served them to a young friend of my son in a salad and he gobbled them up, not even noticing they were there. If you have any nutrition information for cattails, or any tried and true recipes, I would love to hear about them!